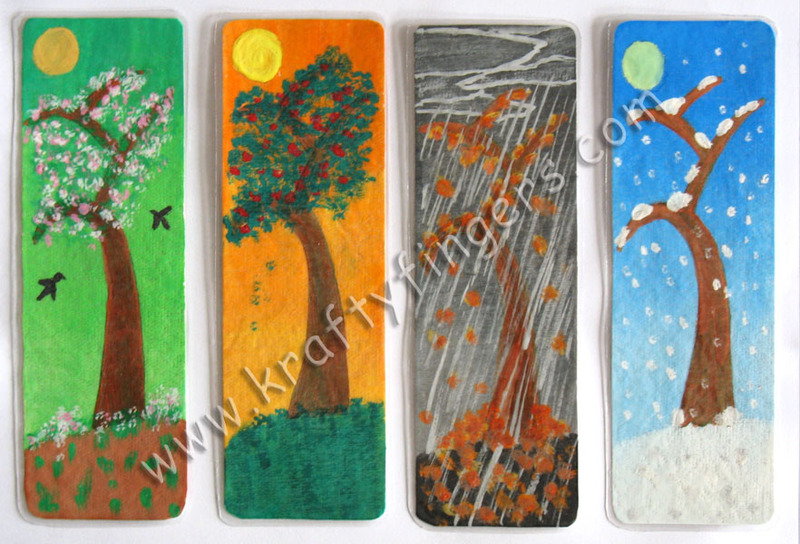 This handmade bookmarks set, in the theme of 4-Seasons, has been done in water painting on handmade paper. After completion, I had them plastic-laminated for durability. The four bookmarks in this collection depict Spring, Summer, Monsoon/Fall and Winter. These matching bookmarks were one of the three giveaways for the readers of my personal blog, to celebrate my 600th post on that blog. My personal favorite in this collection is the Winter-Snow one, but that's only because I'm majorly partial towards all shades of blue! This bookmark set, featuring the four landscapes, is a part of the "Made-To-Order Collection" here. But you can contact me if you'd like to place an order for this product. I will be happy to make it for you. or even to discuss custom orders. Be among the first ones to receive new posts from KraftyFingers. All content on this website is copyrighted. You are free to use the designs & ideas for your own art-work, but if you are directly using any part of the content posted here (photographs or text) on your website/blog/other publication, then please credit it with a link to this site.